There’s no denying it. Summer is dead. And here are just a few of the things that are putting a smile on our faces. Things we’ve fallen for. Fallen for. 1. Pumpkin Spice latte Whether you love Starbucks or want it removed from your neighbourhood, you’ve gotta admit there’s something about their Pumpkin Spice lattes – back in store now! – that make you feel all warm and toasty inside. How can anything bad happen when you’re sipping on this potent mix of sugar and dreams? From all the Starbucks in the world. 5. Tinsel garland We’re going to be spending a lot of time indoors. Time to get a Confetti System-style glitzy garland above the bed. In autumnal golds and bronzes, naturally. We’ll be making our own soon and giving you a how-to on the blog. 7. Cosy Camel Because a longline camel coat never goes out of style, like this one modelled by Atlantic Pacific, a fashion blogger we like. 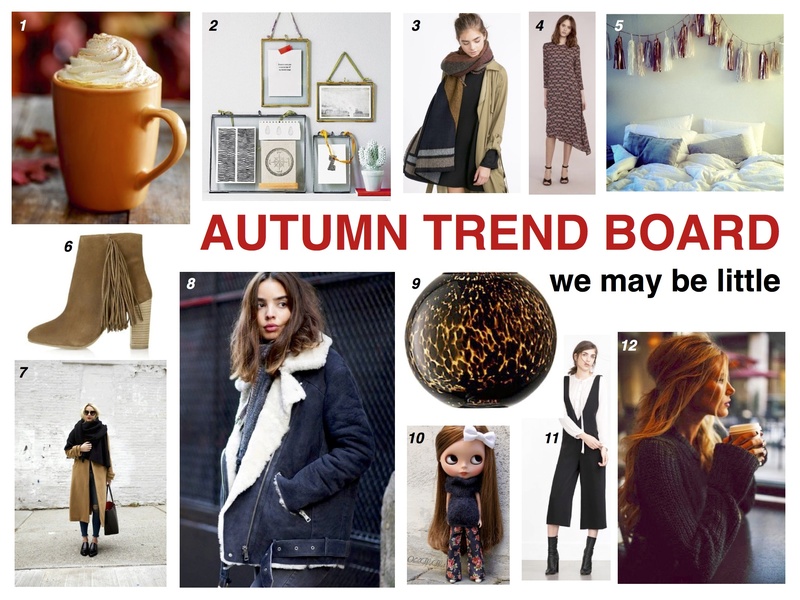 *NB: This trend board is pretty female-centric on the fashion front. We know. For those of a more masculine persuasion, never fear. Your time is coming.